National Center for Education Statistics Peggy Carr, and more! 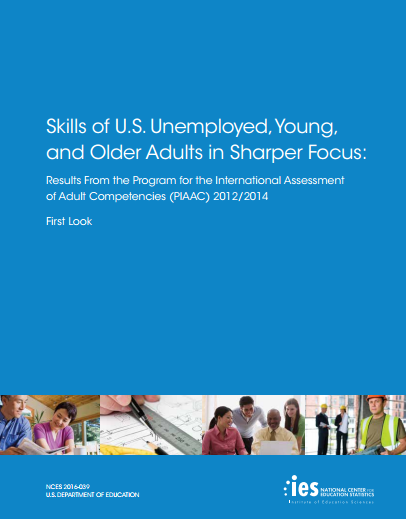 Competencies (PIAAC) 2012/2014: Main Study and National Supplement Technical Report, and an updated NCES International Data Explorer (IDE), with combined 2012/2014 data. a report presenting results from the U.S. PIAAC Prison Study, is expected to be released in mid-2016. among U.S. young adults (ages 16–34). Stay tuned for more information and check the PIAAC Gateway for updates. The Buzz is pleased to announce that links to all of the materials from What We Need Skills For: The PIAAC Research Conference 2015 can now be found on the PIAAC Gateway web page. In addition to a photo gallery, you can find links to summaries, presentation slides, and video-recorded sessions of each panel from the conference, held on December 10–11, 2015, in Arlington, VA. Peggy Carr, Acting Commissioner of the National Center for Education Statistics (NCES), dedicated the conference to the late Dr. Eugene Owen. Dr. Owen was the first Director of the International Activities Program at NCES, and he played an instrumental role in the development of PIAAC as well as other international assessments. More than 130 researchers, policymakers, and practitioners from government agencies, universities and adult education programs, foundations, policy shops, and think tanks gathered to hear the latest PIAAC-related research on topics including education and the workforce, skills acquisition and decline, immigration, health, and women and STEM. Educational Testing Service (ETS) researchers presented on studies that looked at results from th e PIAAC reading components assessment and analyzed the problem solving in technology-rich environments log files. Practitioners at the conference were especially pleased to listen to a preview of two research-to-practice guides based on the PIAAC literacy and numeracy frameworks. 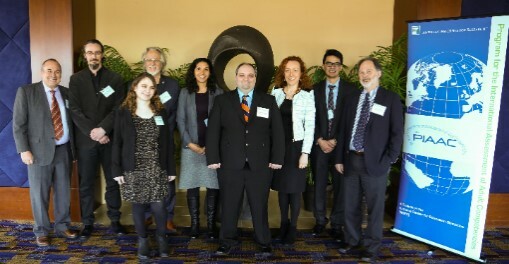 The distinguished presenters, moderators, and discussants fueled lively small-group discussions about the relationships between the skills assessed in PIAAC and social and economic outcomes as well as the implications of the findings for policy and practice. One of the focuses of our research at the University of Hamburg’s Institute for Lifelong Learning is the study of adults who have low literacy skills. With the national Level- One Survey—whose aim was to establish a benchmark for the dimension of illiteracy in the German population—we have been assessing adult competencies since 2010. In addition, since Germany’s federal government started a Decade for Alphabetization and Basic Skills in 2015, I am particularly interested in the kinds of policy recommendations that can be drawn from the international PIAAC data. Therefore, I particularly enjoyed the discussions on the role of institutions and policies in enabling or constraining opportunities for education. Furthermore, we have a cooperative project with the GESIS-Leibniz Institute for the Social Sciences in which we use the PIAAC reading component measures, as well as data about individual literacy practices, to identify different subgroups of adults with lower literacy skills and give recommendations on how to address them in an adequate way. Hence, it was very informative to listen to John Sabatini’s analysis of the reading skills of U.S. adults and important to hear Amy Trawick’s remark that inside basic education programs we also have to consider the engagement of adults with literacy. So, thank you for the opportunity to participate in What We Need Skills For: The PIAAC Research Conference. I am looking forward to your conferences in the future. We are very grateful to have had the opportunity to participate in What We Need Skills For: The PIAAC Research Conference in December. 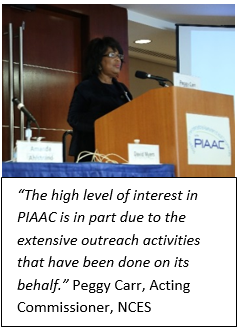 We enjoyed the presentations and were pleasantly surprised by the thematic diversity in which PIAAC data are used. The research projects presented at the conference demonstrated the unique aspects of the topic of interest combined with thorough analyses. The small-group discussions gave us the opportunity to meet other researchers and share our thoughts on PIAAC, which we enjoyed very much. We followed the German PIAAC respondents for three additional waves to collect further information on the respondents themselves and their family members. The data from the first wave of PIAAC-L, conducted in 2014, will be released in March 2016. The PIAAC Prime Age dataset, which includes an oversample of 560 cases in the age group of 26–55, has already been released. This dataset allows for in-depth analyses of issues related to the labor market. In the German supplemental study, Competencies in Later Life (CiLL), 66- to 80-year-olds were surveyed and tested using the PIAAC assessment. The CiLL data will be available shortly. In a joint initiative with the DIPF (www.dipf.de), we are designing a tool to make the PIAAC log files available to users. These data will allow for analyses of the individual steps performed by respondents during the computer-based PIAAC assessment. Finally, the German PIAAC scientific-use file is available for researchers and contains some variables that are not available in the German public-use file, such as continuous age and income. The U.S. PIAAC research conference was made possible by a generous contribution from the American Institutes for Research (AIR). Most of the papers presented were commissioned by AIR through funding provided by NCES. 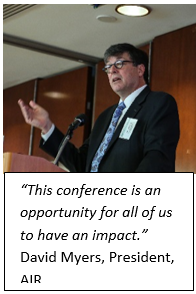 To visit the 2015 conference web page, click here. For summaries of some of the papers and a list of authors, please visit http://piaacgateway.com/researchpapers/. Full copies of research papers will be available later this spring. 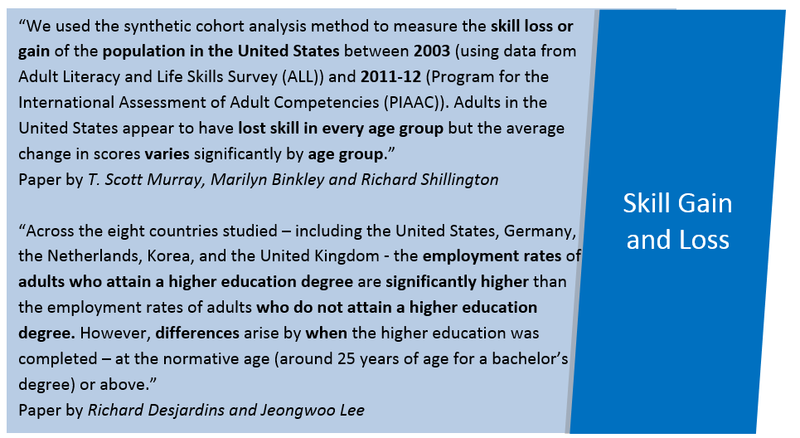 The research papers that were presented at What We Need Skills For: The PIAAC Research Conference 2015 will be available this spring on the PIAAC Gateway. The papers are based on the PIAAC data and cover social issues ranging from workforce and education to immigration and health. Read on to explore a few of the key findings from the papers and visit the conference webpage to learn more. If you plan to attend the American Educational Research Association (AERA) conference in Washington, DC, on April 8–12, look for “What PIAAC Says About the Effects of Social Background on Adult Skills and Social Mobility,” which will be chaired by AIR PIAAC Director Jaleh Soroui. The session will include three presentations and a question-and-answer segment for the presenters and discussant. The session will be held on Sunday, April 10, 8:15 am–9:45 am, in the Convention Center, Level One, Room 149B. Dr. Eugene Owen Scholarship Fund: The Inter-university Consortium for Political and Social Research (ICPSR) at the University of Michigan is offering a scholarship for senior graduate students or outstanding pre-tenure scholars to attend one of the two 4-week sessions, or a single 3- to 5-day workshop, in the ICPSR Summer Program. Applicants must have professional interests in advancing cross-national research on K–12 student achievement, advancing cross-national research on college- or university-level achievement, or understanding the role of teaching from a cross-national perspective. The scholarship honors the late Dr. Eugene Owen, who played an instrumental role in the creation and development of PIAAC as well as three international student assessments and an international teacher survey. For more information about the scholarship and how to apply, see the flyer and visit the website. Applications are due April 30, 2016. A $75 million, 5-year initiative, New Skills for Youth, aimed at investing in high-quality career-focused education that will enable young people to prosper in the growing global economy was announced last month by JPMorgan Chase & Co., the Council of Chief State School Officers, and the National Association of State Directors of Career Technical Education Consortium. Read about the initiative here. The National Council for Adult Learning (NCAL) was established to improve adult education and workforce skills in the United States by fostering an environment more sensitive to employer workforce needs and helping to move low-skilled adults and incumbent workers toward readiness for college, self-sustaining employment, and fuller civic participation. Visit the NCAL website a check out NCAL’s latest newsletter here. To receive the newsletter, send your name, affiliation, and e-mail address to info@ncalamerica.org. The PIAAC team at AIR is preparing tweets for the NCES Twitter feed. To access the NCES Twitter feed, click here. The second PIAAC International Conference, held in November 2015, showcased papers on issues such as the deployment of skills in the economy, returns to education and skills, and the influence of workplace training. It also provided an opportunity for researchers to demonstrate the wide-ranging applications of PIAAC data and for policymakers, other researchers, and various stakeholders to discuss the findings. Links to research papers and presentations are available on the conference website. The conference was organized by the OECD in collaboration with the Research Centre for Education and the Labor Market at Maastricht University and the Dutch ministries of Education, Culture and Science; Social Affairs and Employment; and Economic Affairs. In January, NCES released an updated PIAAC International Data Explorer (IDE). The PIAAC IDE now includes gap analysis and regression analysis capabilities. Explore the new features here. 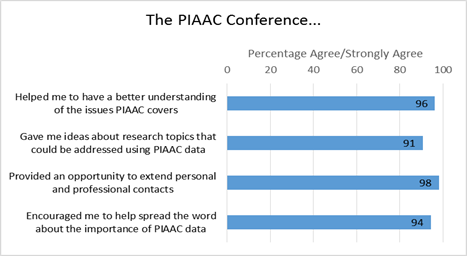 The 2015 U.S. PIAAC Conference resources (including photos & videos!) are now available on the Gateway. The page is accessible through the home page or the “News & Events” tab in the header on each page. The OECD Education at a Glance 2015 report, which includes PIAAC data, has been posted as the latest PIAAC report on the Gateway.